Sometimes there is almost no economic news at all. This isn’t one of those times. Because there have been increasingly ominous signs among the long leading indicators, that have been spilling over into the short leading indicators, suddenly there are a lot of signs and portents to look at. A lot less about jobs and wages that I keep exclusively here. So, once again I got waylaid preparing a long piece for Seeking Alpha, on how the Fed may need to *cut* rates quickly in order to avoid a recession, that may not get posted until tomorrow. In the meantime, here are a couple of graphs to give you something to chew on. First, I’ve noted in the last few months how wages for ordinary workers have started to take off. 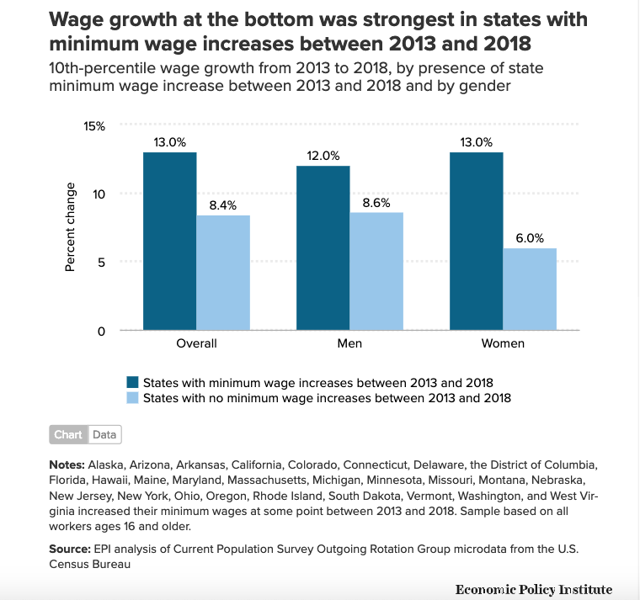 A few people have pointed out that it may be less due to overall tightness in the labor market and more due to statutory minimum wage increases. The four week moving average of initial claims, at 225,000, is only about 9% above its low point 6 months ago. That does show some weakness, but not enough to warrant even a yellow caution flag at this point. Have you not SEEN all articles about tent cities and shantytowns, and how homelessness has exploded into a genuine crisis? If so, how could you POSSIBLY claim the the labor market is “tight.” Yeah, only if you don’t count the many millions who have joined the ranks of the permanently unemployed and would presumably prefer a roof over their head if they could find a job that paid enough to get them back on their feet. But hey, they don’t “count” to economists any more than they do to cruel, heartless politicians like Trump and Obama, do they?